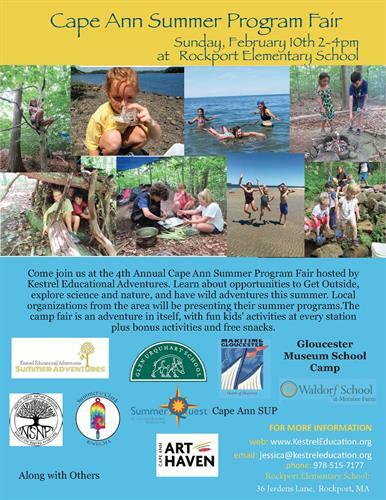 Come join us at the 4th Annual Cape Ann Summer Program Fair hosted by Kestrel Educational Adventures. Learn about opportunities to Get Outside, explore science and nature, and have wild adventures this summer. Local organizations from the area will be presenting their summer programs. The camp fair is an adventure in itself, with fun kids' activities at every station plus bonus activities and free snacks. Learn about summer programs from: Kestrel Educational Adventures, Glen Urquhart School, North Shore Nature Programs, Clark School, Waldorf School at Moraine Farm, Summerquest camp with The Trustees of Reservations, Maritime Gloucester, Gloucester Museum School Camp, Cape Ann Art Haven, Eastern Point Yacht Club, and Cape Ann SUP and others.